Visitor Story: In September 2017, Partners for Clean Streams hosted the 21st Annual Clean Your Streams Day in Northwest Ohio. This program is a concentrated regional cleanup effort that galvanizes 1,000 volunteers each year. In the past year alone, Clean Your Streams Day removed 23,789 pounds of debris from local waterways, including 94 tires. 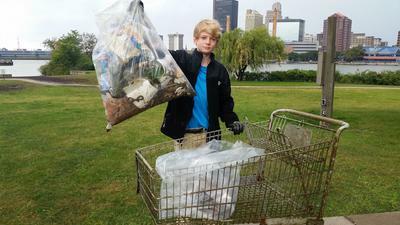 Volunteers spread out across 69 cleanup sites, covering over 25 miles of riverbank. Groups and individuals of all ages, backgrounds, and affiliations united to give back to the waterways that give us so much. Data from this cleanup is collected and submitted to the International Coastal Conservancy's database in order to track what and how much debris is polluting our water systems. With this information, we hope to make policy changes that can prevent pollution at the source. Until then, Partners for Clean Streams will focus on getting the trash out of the water and people into them. Editors Comment: Thanks so much for sharing that story with us. We hope this will inspire some others to get busy. As our other visitors can see, it requires a fair amount of organization to mount a stream clean up of this magnitude. Arranging for disposal of the debris, recruiting 1,000 volunteers, telling them where they can best help, keeping track of their contact information, answering questions, doing your best to make sure people have gloves and appropriate footwear and sunscreen, and more can keep an organizing committee quite busy. But look at the results! The data collection aspect of this seems especially worthwhile, although that too must be the subject of advance planning or it won’t happen. Partners for Clean Streams seems really on top of it, but others of you will want to take note that you need to really publicize your results. Heaps of trash are quite photogenic, and you should be sure to recruit your local television stations to give you coverage and take full advantage of social media. Our hope and belief is that this visual feedback makes a few people stop and think before they just dump something directly into a stream or toss it on the stream bank so that it eventually winds up in a stream. Don’t you wonder why people dispose of their tires in a stream? We suppose they are doing that to avoid the tire disposal fees that may be in effect in their area. Sometimes cities will offer a tire amnesty day, with free disposal of any tires people may have lying around the basement or garage. We would like to see more of that occurring; watershed groups could definitely help organize this, especially when more than one municipality is involved. Join in and write your own page! It's easy to do. How? Simply click here to return to Stream Clean Up.